Capitol Sweeping Services, Inc. was founded in 1986 by Tom Kuhns and Lesa Kuhns with a goal to meet the needs of every customer with excellence of service and exceptional value. Today, from our 17,000 square foot Windsor location, we operate more than 50 pieces of pavement maintenance related equipment, serving all of New England. You'll notice our pristine vehicles and highly skilled crew members Sweeping America the Beautiful 24 hours a day, 7 days a week, 365 days a year. We invite you to contact us with your sweeping, maintenance and litter removal projects. 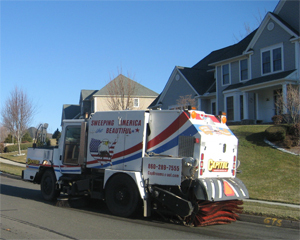 We guarantee your satisfaction and strive to ensure you are pleased you have chosen Capitol Sweeping Services, Inc. as your full-service roadway and parking lot maintenance company.